The best way to correct presbyopia (age-related long-sightedness) is with a pair of glasses with varifocal lenses: the multifocal lenses allow you to enjoy see things easily and precisely – whether objects are near, far or somewhere in-between. Thanks to the intermediate zones, a smooth transition between the individual viewing zones is created so that you can see clearly at any distance. 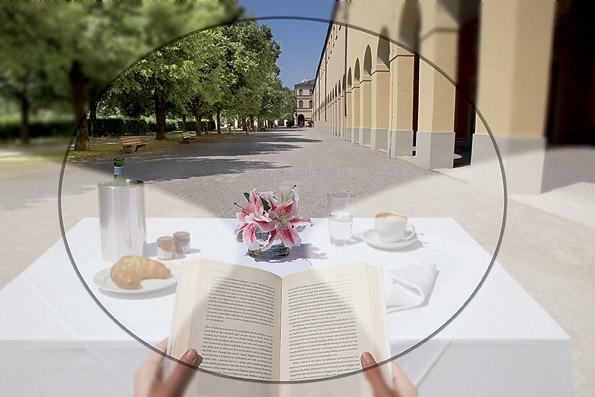 This division of the varifocal lenses comes closest to natural vision and is perceived as “comfortable”. For the outside observer, glasses with varifocal lenses look like a pair of glasses with single vision lenses, since there are no visible separating edges as there are with bifocal lenses. The person suffering from age-related loss in sight is no longer noticeable as one since the varifocal lens makes the wearer appear younger. The topic of varifocal lenses is particularly important to us at Geldmacher in Bad Salzdetfurth. We have made a name for ourselves – and not only in professional circles – with the development of our own centring system, the InFocus. We have thus been able to demonstrate our level of specialization with our customers in particular.